Barnstable has been responsible to date in not pursuing bans or additional moratoriums on legal cannabis businesses, which are expected to begin getting licensed in summer 2018. Barnstable has an opportunity to put in place smart zoning measures regarding cannabis businesses that will help the town in numerous ways. Here are three of them. Getting smart zoning regulations in place now will put Barnstable far ahead of other towns that aren’t as foresighted. Instead of rushing under pressure to figure out where cannabis businesses should be located and what kinds of businesses are best for the town, Barnstable has the chance to put everything into place early in order to ensure a smooth, organized application process. Barnstable can avoid the stress and confusion of creating zoning as the state is issuing licenses. Barnstable is a town of many villages. Smart zoning will provide the right approach in determining how many cannabis businesses should be allowed in town and how they should be distributed in order to create fairness for all villages and residents. While images of cannabis businesses usually conjure up retail shops, licenses are also being issued for testing, manufacturing and cultivation facilities. Moving forward with smart cannabis zoning now will help Barnstable determine what business mix is right for the town. Taxed-and-regulated cannabis facilities will present significant economic benefits to Barnstable. In Massachusetts today, the average annual sales for medical marijuana dispensaries is $7 million. With the six-percent local tax option available under the new law, that would mean new annual tax revenue of at least $420,000 from a single storefront--and likely more, given the larger non-medical consumer base. Plus, new shops would create new jobs and new direct business for electricians, construction works, HVAC companies and more. Smart zoning will give Barnstable a head start in securing this new source of revenue and jobs. Want to be part of the solution? Get involved in Barnstable! 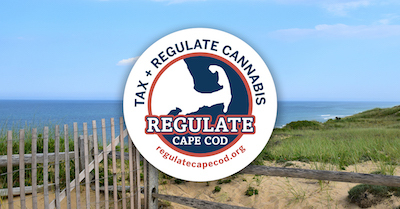 Don't let the black market rule our Cape Cod community. Stay up-to-date on where and when to get involved to ensure we Regulate + Tax cannabis. Thank you for your interest! We'll keep you up to date.